So I realized as I was putting together a guest post for IxDA Lansing that I had completely forgotten to post this. I don’t know where my brain has been recently. I hope it’s warm and sunny wherever it is. For Saturday we didn’t start out the day with a keynote, but instead with two tracks of Lightning Talks. I stuck to my location in the main room and caught Charles Hannon talking about how neuroscience affects usability. While some earlier in the conference challenged design patterns, Hannon talked about how and why they work. When the patterns disappear emotions such as panic and anxiety edge their way into the picture keeping people from being able to focus on the big picture. In this talk, which Josh Clark said could also be ‘Make Me Think’, he contended that complexity and challenges are not the same thing. For instance, the Wenger Giant has every tool you can think of, but you can’t really use it. While complexity is not evil, it does need to be managed. Clark outlined focus, conversation, touch and exploration as ways of doing this. For Adam Connor’s talk he introduced us to a number of film methods that can either be put to use in our development processes or taken advantage of for use in design. An example of the first would be the use of beat sheets to convey the emotional states of the system and user for various stages in a process, while an example of the second would be the use of rack focus or shifting the depth of field. One piece of movie trivia – which side does the bad guy enter from? I’ve done a lot of marketing related things in various jobs and so this was not a tlak I originally planned to attend, but I am glad I did. Megan Grocki did an awesome job talking about modern marketing and how Marketing methods of 10 and 20 years ago are, to large extent, no longer relevant. Instead, marketing needs to be approached from the view that anything a company does to engage their customer is marketing. Also, the best marketing is done when both company and customer are aware of what is going on and are satisfied. Scott Geoffrey Newson stepped beyond the digital world to the physical by sharing about the impact of real life interaction using references to Undercover Bosses, UBC’s Sprouts program, UK Waste Strategy Awareness Managers and the building men of Glasgow. Brenda Laurel kicked off the afternoon with an analysis of the changes that have occurred in the last 35 years through the eyes of one who was there through those changes. She reference 6 keys that brought these changes about – technology, action, senses, culture, nature & emergence. A few examples would include Atari (tech, culture), Hole in Space by Electronic Café (emergence) and the Girl Gamer Revolution (action, culture, nature, emergence). Engagement is success and gamification is a hot field. Paris Buttfield-Addison denies neither of those statements, but did caution us that gamification needs to be done correctly. Pasting badges on top of a site is not the key to customer interaction. Instead, gaming aspects should be interested in achieving a higher goal and started with a vision – not just bolted on top. Think beyond fun to compelling interactions that will engage customers in a series of interesting decisions that are not too hard to be frustrating and not too simple to be boring. To see gamification put to use for higher purposes, check out thefuntheory.com. This is another one that I didn’t necessarily think I would get a lot from, but as Nina Walia shared the findings from user research that she had been a part of for kids ages 2-5 and iPhone apps, I realized that a lot of these can be applied to adults as well. We are just grown up kids after all. We’ve just learned to compensate for the deficiencies of most devices like the difficulty of tapping and accidentally hitting the home button instead of back. Also, the videos that she shared of a few of the tests were super cute as well as informative. Stephen Anderson built on the base set up earlier in the day by Clark and Butterfield-Addison by encouraging looking deeper at the reasons that customers stay. Pasting a game on top isn’t enough. Its just sugar coating. It does need to be deeper, so he encouraged us to find the principles already at work in our products and use those to build engagement with our users. That may or may not involve elements of play. As he said, it takes more than delightful experiences to keep users. Long term they are more interested in whether it works and whether work is getting done to improve it. Bruce Sterling is an entertaining speaker. He’s also not afraid of giving critique. So, laced with humor and supported by the immediately preceding happy hour, he combined his observations from throughout the conference with his previous knowledge of interaction design to give a good critical look at the community. He encourage user sympathy but cautioned against getting so caught up with users that we start suffering from User Stockholm Syndrome. He also cautioned us against getting so caught up in the design that we forget the less sophisticated user. Thus his final thought to us – How do you treat people who just don’t get it… that’s the real question. So closed out the speaking portion of the conference. 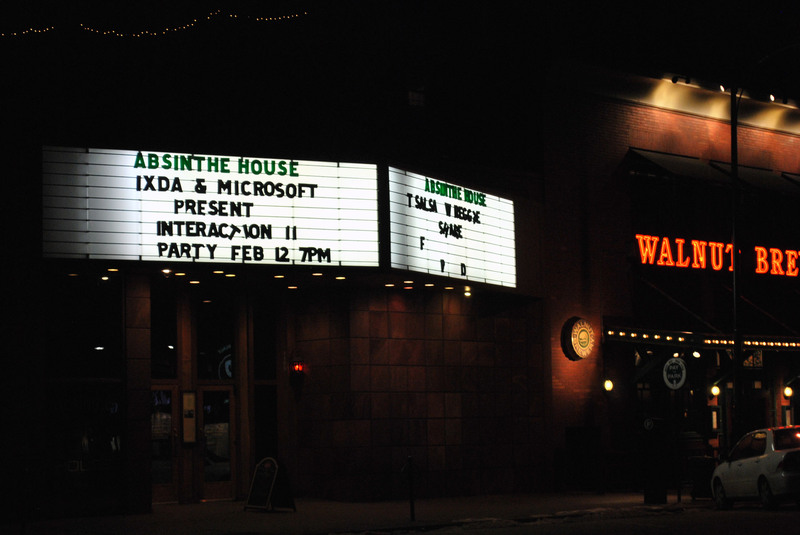 Afterwards, Microsoft sponsored quite the bash at the Absinthe House with an open bar, dancing, a photo booth and even a Kinect to play with. It was a great event that I am very glad I had the opportunity to attend. Now to start plotting for Interaction12 in Dublin, Ireland.